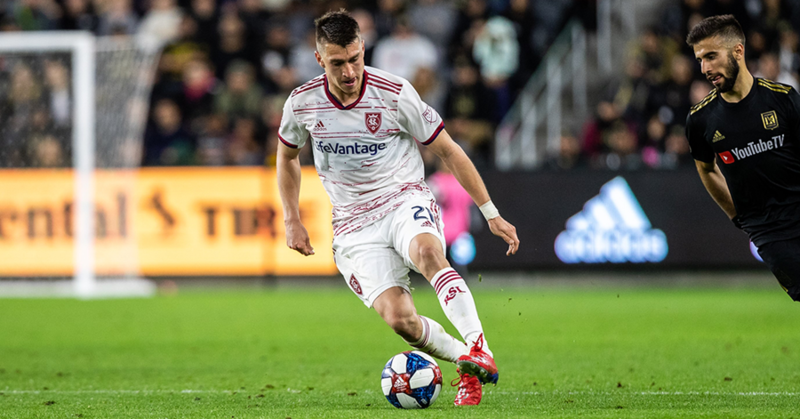 On March 23, three Arizona players were in the starting lineup for Real Salt Lake in their match against LAFC - Brooks Lennon, Tate Schmitt (pro debut), and Donny Toia. Can you name team and players when this last happened seven years ago? The answer is two paragraphs away. Question aside, the Arizona Soccer Association would like to congratulate Tate Schmitt on his pro debut. Schmitt played for CCV Stars, Real Salt Lake - Arizona Academy, and attended Desert Vista High School. Other good news, Sam Gleadle scored his first professional goal this past weekend. WATCH ?? | WHAT A FINISH BY @SamGleadle23!! Answer: D.C. United - Danny Cruz, Nick DeLeon, Brandon McDonald. It happened on June 24, 2012 when the New York Red Bull defeated D.C. United 3-2. Greg Vanney, Head Coach, Toronto FC - On Friday, defeated NYCFC 4-0. Rick Shantz, Head Coach, Phoenix Rising FC - On Saturday, played Colorado Springs to a 2-2 draw. Justen Glad, D, Real Salt Lake - Glad is currently injured. Brooks Lennon, D, Real Salt Lake - Started and played 90 minutes in RSL's 4-2 loss to FC Dallas on Saturday. Donny Toia, D, Real Salt Lake - Did not appear in RSL's 4-2 loss to FC Dallas on Saturday. Tate Schmitt, F, Real Salt Lake - Did not appear in RSL's 4-2 loss to FC Dallas on Saturday. Schmitt did make his pro debut on a start against LAFC on March 23. Luis Robles, GK, New York Red Bulls - Started, played 90 minutes and made 4 saves in a 1-0 loss to Chicago on Saturday. Nick DeLeon, M, Toronto FC - Started and payed 90 minutes in Toronto's 4-0 win over NYCFC on Friday. Niki Jackson, F, Colorado Rapids - Did not appear in Colorado's 4-2 loss to Houston. Grant Lillard, D, Chicago Fire - Did not appear in Chicago's 1-0 win over NYRB on Saturday. Matt Bersano, GK, San Jose Earthquakes - On loan with Reno 1868 - With Reno, Bersano started and played 90 minutes in Reno's 3-3 draw against OKC Energy FC on Saturday. Damian German, F, Real Monarchs - Was a 80th minute substitute in Real Monarchs 1-0 loss to Las Vegas on Saturday. Jose Hernandez, M, LA Galaxy II - Did not appear in LA Galaxy II's 3-2 win over Portland on Saturday. IIlijah Paul, F, Phoenix Rising FC - Did not appear in Phoenix Rising's 2-2 draw against Colorado Springs on Saturday. Brandon Keniston, GK, Phoenix Rising FC - Did not appear in Phoenix Rising's 2-2 draw against Colorado Springs on Saturday. Justin Davis, D, Nashville SC - Nashville did not have a match this past weekend. Sam Gleadle, F, Reno 1868 - Was a halftime substitute and SCORED A GOAL (first pro goal) in Reno's 3-3 draw against OKC Energy FC on Saturday. Cassie Miller, GK, PSV Eindhoven: PSV did not have a match this past weekend.